Artisan Stone Residential Street Number Sign - - personalized one line address plaque. 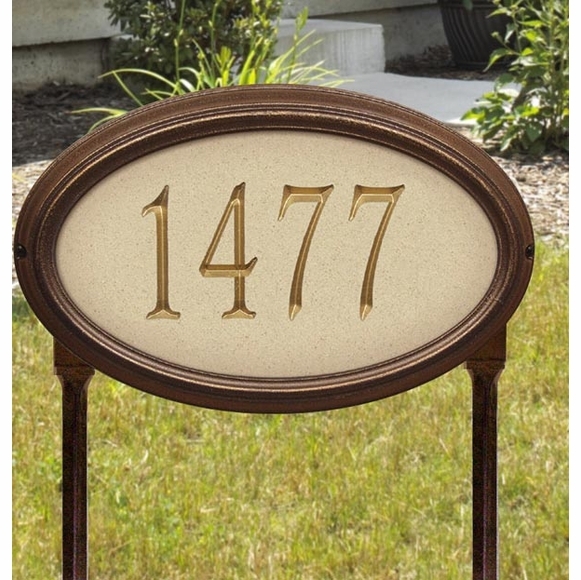 15" x 9.5" residential address plaque holds five 4" numbers. Includes hardware for wall mount installation. and include two 18" stakes for convenient set up. Wide multi-tone frame adds an attractive dimensional element. Dimensions: 15"W x 9.5"H x 1.25"D.
House number sign with large 4" numbers and distinctive dimensional frame.